Provided by: Coldwell Banker Res. R.E. 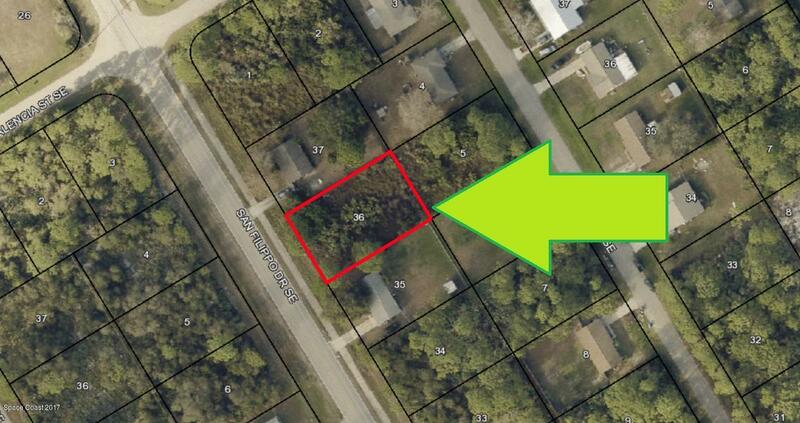 Buildable 0.23 acre lot with city water available in Port Malabar Unit #16. Conveniently located near the PGA Majors Golf Course in the SE Section of Palm Bay, this lot is just 2.8 miles 5 minutes to Publix SuperMarket at Bayside Lakes, 4.3 miles 9 minutes to Bayside High School, 10.5 miles 22 minutes to Melbourne International Airport, and 12.5 miles 25 minutes to the beaches of Indialantic. From exit #173 of I 95, go west on Malabar Road NE for .2 miles, and left on San Filippo Drive SE for 2.7 miles. The property will be on your left. I am interested in 851 San Filippo Drive, Palm Bay, FL 32909.